Is Mina Kimes Lesbian ? Born and raised in Omaha, Nebraska, Mina Kimes is an LA-based American investigative journalist who specializes in business and sports reporting. She has written columns for Fortune, Bloomberg, and ESPN. Kimes won Front Page Award for business reporting for her piece of an article entitled "The Sun Tzu at Sears". Besides this, she was honored with multiple awards including Henry R. Luce Award (2010), AAJA National Award (2012), Front Page Award (2013) and others. Currently resides in Los Angeles, California, Kimes is happily married to Nick Sylvester since 2015. Mina Kimes was born Mina Mugil Kimes on September 8, 1985, in Omaha, Nebraska. She is American and belongs to the mixed ethnicity (American and Korean). Soon after her graduation, Mina Kimes joined Fortune Small Business Magazine in 2007 where she served as a business journalist. She worked there for seven years before her departure in 2013. During her time on Fortune, Kimes won several prestigious awards from the "New York Press Club", "The Asian American Journalists Association", and "The National Press Club" amongst other places. In 2012, she received "Henry R. Luce Award" for her investigation named Bad to the Bone which exposed the unauthorized use of a cement to repair bone tissue with lethal consequences. Even, the Columbia Journalism Review involved her exposes among its business must-reads article of 2012. Mina Kimes joined Bloomberg News Agency in 2013 as an investigative reporter. She won the Front Page Award for business reporting for her articles like King Kat and The Sun Tzu at Sears. In 2014, she left Bloomberg in order to pursue her career in ESPN. Kimes wrote an article about a "bond between herself and her dad and the Seattle Seahawks" on Tumblr which received massive popularity among the international market. Later, she wrote about other young sportspeople as well which includes Devonta Pollard of University of Houston basketball player who got mixed up in his family dispute and, at one point, testified against his own mother. Kimes also contributed to the profiles of NFL players Aaron Rodgers, Antonio Brown, Darrelle Revis, and Martellus Bennett. She has written about the Korean League of Legends star Faker. She is an active panelist on American sports roundtable, Around The Horn. Mina Kimes' has earned a good sum of net worth from her journalism career. Her estimated salary is $1 million as per some online sources but no official confirmation has come about it. Kime made $100k per year from Bloomberg before her departure in 2014. Currently, she served as a business journalist in ESPN and her annual salary is above $400k. 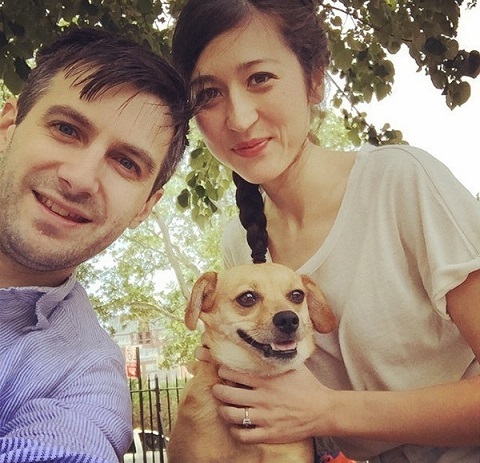 Mina Kimes is a married woman, she exchanged a vow with her longtime boyfriend, Nick Sylvester in 2015. Their wedding was a private family ceremony held in the presence of their friends and family members. Kimes shared her wedding picture on her Instagram where it looks like her dog was the bridesmaid for a wedding. She is quite secretive about her private life which might be the reason she hasn't shared much about her husband with media. In early 2015, she tweeted about her ex-boyfriend marrying model which created a buzz. Kimes shared a strong bonding with her dog, Lenny. She often shared her dog pictures on her social sites to whom she refered to her son. Currently, she is living a prosperous life along with her husband and pet. Kimes is a huge fan of the American football team, Seattle Seahawks. She has a tattoo on her right inner bicep inked by "XLVIII" which was dedicated to a Seahawk victory in the Superbowl series. Nick Sylvester and Mike Kimes tied the knot in 2015 at an intimate ceremony. They were together for a long time.